In the Lebor Gabála Érenn, a medieval Irish Christian pseudo-history, the Milesians (Irish: gairthear Mílidh Easpáinne) are the final race to settle in Ireland. They represent the Irish people. 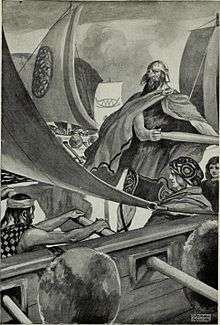 The Milesians are Gaels who sail to Ireland from Iberia after spending hundreds of years travelling the earth. When they land in Ireland they contend with the Tuatha Dé Danann, who represent the pagan gods. The two groups agree to divide Ireland between them: the Milesians take the world above, while the Tuath Dé take the world below (i.e. the Otherworld). They are named after the character Míl Espáine, which is the Irish form of the Latin Miles Hispaniae ("Soldier of Hispania"). Scholars believe that the tale is mostly an invention of medieval Christian writers. The Lebor Gabála, which was probably first written in the 11th century AD by Christian monks, purports to be a history of Ireland and the Irish (the Gaels). It tells us that all mankind is descended from Adam through the sons of Noah, and that a man named Fénius Farsaid (descendant of Noah's son Japheth) is the forebear of the Gaels. Fénius, a prince of Scythia, is described as one of 72 chieftains who built the Tower of Babel. His son Nel weds Scota, daughter of an Egyptian pharaoh, and they have a son named Goídel Glas. Goídel crafts the Goidelic (Gaelic) language from the original 72 languages that arose after the confusion of tongues. Goídel's offspring, the Goidels (Gaels), leave Egypt at the same time as the Israelites (the Exodus) and settle in Scythia. After some time they leave Scythia and spend 440 years wandering the Earth, undergoing a series of trials and tribulations akin to those of the Israelites, who spent 40 years wandering in the wilderness. Eventually, they reach Iberia by sea and conquer it. There, Goídel's descendant Breogán founds a city called Brigantia, and builds a tower from the top of which his son Íth glimpses Ireland. Brigantia refers to Corunna in Galicia (which was then known as Brigantium) and Breogán's tower is likely based on the Tower of Hercules, which was built at Corunna by the Romans. Íth sails to the island with a group of men. He is welcomed by its three kings: Mac Cuill, Mac Cecht and Mac Gréine. These three are members of the Tuatha Dé Danann, who ruled Ireland at the time. Evidence suggests that Tuath Dé were the main pagan gods of Ireland. Íth is then killed by unnamed attackers and his men return to Iberia. The eight sons of Íth's brother Míl Espáine (whose given name was Golam), lead an invasion force to avenge his death and take Ireland. After they land, they fight against the Tuath Dé and make for Tara, the royal capital. On the way, they are met on three mountains by Banba, Fódla and Ériu – the wives of Ireland's three kings. They are believed to have been a trio of land goddesses. Each woman says that the Gaels will have good fortune if they name the land after her. One of the Gaels, Amergin, promises that it shall be so. At Tara, they meet the three kings, who defend their claim to the joint kingship of the land. They ask that there be a three-day truce, during which the Gaels must stay a distance of nine waves from land. The Gaels agree, but once their ships are nine waves from Ireland, the Tuath Dé conjure up a great wind that prevents them sailing back to land. However, Amergin calms the wind by reciting a verse. The surviving ships return to land and the two groups agree to divide Ireland between them. The Gaels take the world above, while the Tuath Dé take the world below (i.e. the Otherworld) and enter the sídhe, the ancient burial mounds that dot the Irish landscape. Amergin divides the kingship between Éremon, who rules the northern half of Ireland, and Éber Finn, who rules the southern half. This division of the land was probably invented by the writers to explain and justify the 7th/8th century division between the royal capitals of Tara and Cashel. The Lebor Gabála then traces Ireland's dynasties back to Milesian Gaels such as Éremon and Éber. Modern scholars, however, believe that these were fictional characters and that the writers were attempting to give the medieval dynasties more legitimacy. The claim that the Irish Gaels came from the Iberian region of Galicia may be based on three things. The first is the similarity of the names Iberia and Hibernia and the names Galicia and Gael. Medieval pseudo-historians made similar claims about other nations based only on their names. The second is Isidore of Seville describing Iberia as the "mother[land] of the races". Isidore's works were a major source of inspiration for the writers of the Lebor Gabála. The third is Orosius describing Ireland as lying "between Iberia and Britain". The Roman historian Tacitus also thought that Ireland lay between Iberia and Britain. John Carey notes that if Iberia was thought to be the part of mainland Europe nearest to Ireland, it would be natural "to see it as the source of arrivals from overseas". Geoffrey Keating's Foras Feasa ar Éirinn (written c.1634) used the myth to promote the legitimacy of the Stuart claim to royal authority in Ireland (related to the origin of the Lia Fáil), demonstrating that Charles I was descended, through Brian Boru, Éber and Galamh, from Noah and, ultimately, from Adam. The lion-rampant motif seen in the Royal Standard of Scotland was used by other clans claiming a Milesian ancestry. In the early modern period many Irishmen and women fled to Spain as a result of political and military turmoil in their homeland. The belief that the Gaelic Irish were descended from Míl Espáine and his Spanish followers was current in Spain as well as Ireland, and as a result the Irish in Spain were given all the rights and privileges due to Spanish subjects. In 1680 King Charles II of Spain issued a decree stating that "the Irish in Spain have always enjoyed the same privileges as Spaniards. This has always been the practice and is actually so today." King Philip V of Spain issued decrees in 1701 and 1718 confirming these rights, stating that the Irish were to be treated as native Spaniards. In 1791, in response to fears about the French Revolution, royal orders were given to create registers of all foreigners then in Spain and to extract an oath of allegiance from them. Three Irish natives living in Cadiz agreed to sign the register, but refused to take the oath which Spaniards were not required to take. The three appealed to the Royal Council in Madrid, who decreed (having consulted the attorney-general) that "the taking of the oath, to which all foreigners have been directed to submit, shall not be extracted from the Irish, seeing that by the sole fact of their settling in Spain the Irish are regarded as Spaniards and have the same rights." King Charles IV of Spain issued a decree in 1792 confirming this decision by his council. ↑ Encyclopaedia Britannica, "A Coruña". 1 2 Carey, John. "Did the Irish Come from Spain? The Legend of the Milesians", History Ireland (Autumn 2001), pp.8–11. ↑ Andrew Hadfield, "Briton and Scythian: Tudor representations of Irish origins", Irish Historical Studies 28 (1993) pp. 390–395.